I woke up this morning knowing what I was going to write about in this post. I was very relieved because, until this morning, I wasn't exactly sure! I'm not quite ready to talk about the current project on the easel as it is deeply personal and is taking all the courage I have to work on it. I will be talking about the work very soon though and I have been taking pictures of the work in progress to put into a nice video slide show. The work has been a struggle. It isn't a struggle because of the technical aspect, which is indeed stretching my skills, but because of the emotional aspect. You see, it is taking "all the courage I have to work on it" because it is a subject that leaves me deeply vulnerable, on many levels. I have a renewed respect for the many artists out there that I particularly admire. I knew their work took skill to create but I didn't realize just how much courage it took, not just to create it, but to finish it and then put it out into the world. Never being one to ease into the waters of uncertainty little by little, I have jumped into the deep end in a couple areas in my life, not just art. I have to admit, I find it rather exhilarating even though I am no adrenaline junkie. I even don't mind failing since I learn so much each time. That doesn't mean that it isn't painful or that it gets any easier. I will sprinkle talk about the other things I have jumped into here and there in future posts. I think the reason I woke up with this post in my mind this morning is because of the TED video of Brené Brown I viewed yesterday. She so very articulately put into words for me why I was having such an emotional struggle getting this work done. If you haven't viewed her video on vulnerability from last year, take a look at it first (use the search bar at ted.com) and then the current one above. Now that I recognize what is behind the struggle, I am quietly gathering my courage and continuing on. 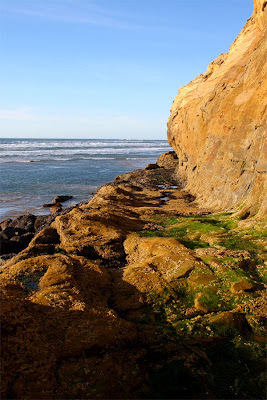 The picture above is the old roadbed at Hug Point, a place I have talked about a time or two in previous posts. In the past, it took an act of courage to travel that road depending on the weather and tides, a different kind of courage than the one I need, but courage none-the-less. Wishing you all a day of beauty...and courage. Your post might have been written just for me. Thanks Renee.